If you have fine, thin hair that always ends up laying flat and looking lifeless, then you need this shampoo. I would honestly never advocate that you should spend $34 on a shampoo that’s only 9.3oz., however if it actually works and you are tired of wasting money trying to test other shampoos, then I feel like I have to at least share my experience of this product with you. So to preface this review, I received a sample of the shampoo and conditioner with one of my Sephora orders and decided to try it out because why not. As soon as I opened the packet, I noticed a strong herbal/licorice kind of smell, which I was initially not very fond of. I decided to use both the shampoo and conditioner and could immediately feel that the strands of my hair felt more plump. Even once I towel-dried my wet hair and brushed it out, I could visibly tell my hair look lifted and voluminous! I shower at night and do not use a blow dryer on my hair. So when I woke up, I was absolutely shocked that my hair had so much volume, but also felt super silky and healthy. My experience with other oil-reducing or clarifying volume shampoos is that they may give lift and body to my hair, but they turn my hair dry and brittle, which is never a cute look. I decided to straighten my hair and still could not get over the lift this gave me at my roots! All I used was a shampoo and conditioner, zero styling products and was able to achieve a voluminous hair effect that I never knew my hair was capable of achieving! I instantly purchased the shampoo on Sephora’s website because I knew I couldn’t be without this product. I didn’t purchase the conditioner because it is just so unbelievably expensive to get the duo. So fast forward to now, I am still absolutely loving this shampoo. I only use it for special occasions because I’m trying to make it last for as long as humanly possible hehe. I just know how absolutely frustrating it is to have fine, ribbon like hair that never looks full, so whenever I find a product that gives me my dream hair, I have to jump on it and share the good news with my pals! Also if you want to attempt to justify the high price-point, this shampoo does have an amazing ingredient list that will make you feel luxurious just by reading it. “Organic and 100 percent natural ingredients, formulated with lemongrass and green tea create body, volume, and bounce by balancing and removing excess oils from the hair shaft, without compromising the integrity of the hair. It’s enriched with quinoa, a gluten free super-food indigenous to South America, to promote healing and moisture retention. Citric juices break down oils, extending the time in between washes. Rich in omega-9, the rahua-ungurahua oil restores, heals, moisturizes and strengthens hair follicles and the hair shaft, resulting in stronger, healthier hair.” Like are you kidding me…I’ve never felt more cool than I do when using a 100 percent natural, vegan, cruelty-free, USDA certified organic ingredient based shampoo. Also important to mention it has no parabens, sulfates or phthalates, which are unfortunately found in most lower-priced shampoos and conditioners. I never would devote an entire post on a hair product, especially a shampoo if it really wasn’t something to rave about. I am of course searching for cheaper alternatives and trying to compare ingredient lists, but it is really hard to find such a natural shampoo that also delivers incredible effects. Plus it will make your hair healthier and stronger the more you use it, which will save you money in the long run because you won’t be spending money on pricey restorative treatments. 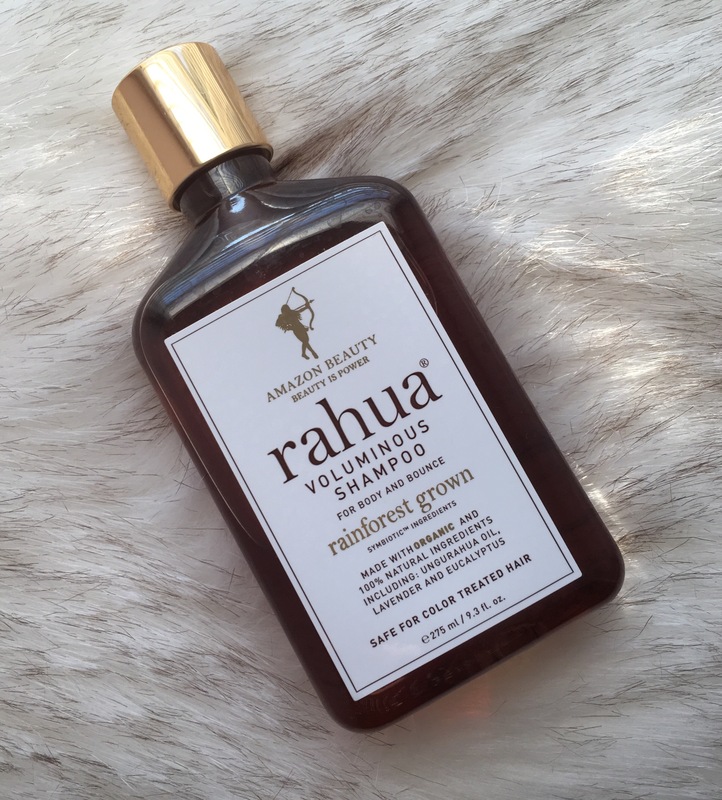 So definitely let me know if you love this shampoo and if you think the conditioner is totally worth it as well (I have a feeling it may be, ugh) because I am really digging this Rahua brand and their stance on creating sustainable products that really work. Thank you so much for reading!